Natural food supplements and green foods in raw food quality are natural power packs. The chlorophyll that gives them their deep-green colour is a miracle of nature. The energy of the sun is stored in it. It only differs from human haemoglobin, the important blood pigment, in practically just one atom. Natural food supplements and green foods in raw food quality offer a rich spectrum of important vital substances in a natural combination. Natural food supplements and green foods in raw food quality contain essential amino acids, vitamins, minerals, trace elements and enzymes. Many vital substances enhance and complement each other in their effect. The whole is more than the sum of the parts. These days we want to feed ourselves not only quickly but healthily as well. Keimling green goods allow you to supplement your diet with important vital substances – light, convenient, reliable and, of course, wholly natural. Some of the most important green foods are algae and cereal grasses. Keimling offers you algae and cereal grasses in raw food quality for your health. Microalgae were among the first creatures on earth. Their genetic code carries the experience of 3 million years of evolution. Not only were algae there at the very start of the evolution of life on earth, they are also at the bottom of the food chain. They are therefore the least spoiled of foods and are exceedingly pure. The Aztecs appreciated the value of spirulina algae in raw food quality. Just like the Kanembu tribe at Lake Chad in Africa. Today raw food algae enjoy growing popularity in Japan, China, Australia, Canada, the USA and Europe. Cereal grasses in raw food quality were eaten in ancient China and Babylon. They are now being rediscovered and are quickly growing in popularity. 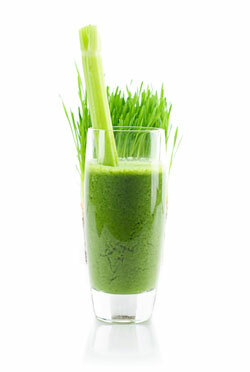 Hollywood stars like to drink a small glass of wheat grass for breakfast, maybe in a wheat grass juice bar in San Francisco, Los Angeles, London or Berlin. Guaranteed all-natural! With my green foods, my commitment is to top quality and unadulterated natural products. I buy green foods in raw food quality only from the very best producers. Producers who use neither pesticides or insecticides. All Keimling green foods in raw food quality are processed as gently as possible to ensure that all the vitamins and enzymes stay active. Keimling green foods contain no fillers or food colouring agents – guaranteed. This entry was posted in Everyday raw food, General. Bookmark the permalink.